Mudpie is juggling the Easter Eggs! Let's hope they're all hard-boiled! Image measures approximately 2-3/4" X 2-3/4". This original design is copyright Ellen Jareckie and House-Mouse Designs. The image is deeply etched and precision cut from premium gray rubber on a 1/8" gray rubber foam backing then mounted on a cling vinyl decal with full sized image for easier storage and use with an acrylic handle sold separately. Made in the USA. 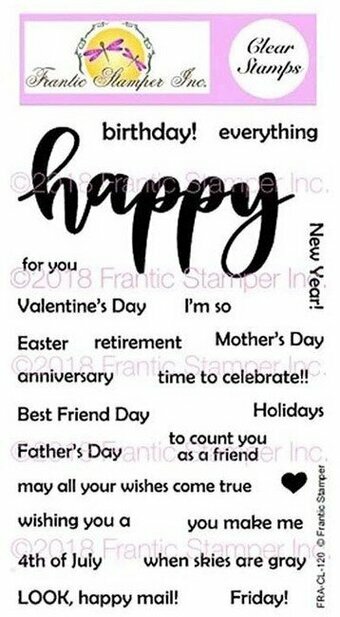 Faithful Thoughts is a 4"x8" set of clear stamps, made of the highest quality, non-yellowing polymer. This stamp set contains 12 stamps to create faith-based projects for Easter. The Crosses on the Hill stamp measures approximately 4.75" x 1.8". Sentiments include: He is Risen, Celebrate the Sonrise, Hallelujah and more. 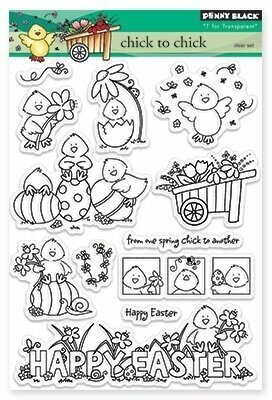 Easter themed stamp from Art Impressions featuring clear stamps of Easter bunnies and an Easter chick! Includes egg stamps. "Here comes the Easter bunny!" "Some bunny loves you!" "Hoppy Easter!" Set of 9. 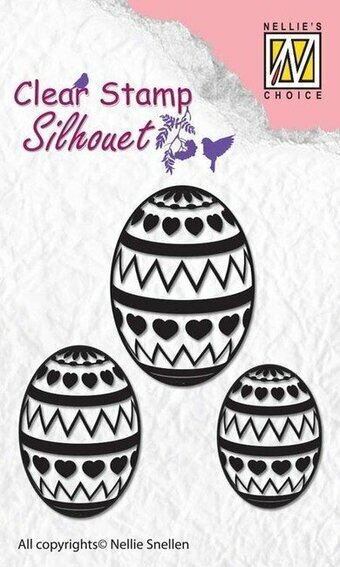 This clear stamp set features beautiful images perfect for Easter! 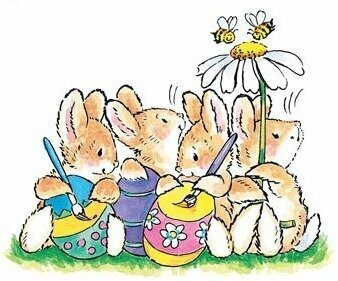 Includes a handsomly dressed rabbit, rabbit in bonnet and apron, decorative floral egg, small bunny and small chick with flowers, a darling row of bunnies, and sentiments "Wishing you a Blessed Easter" and "Happy Easter". 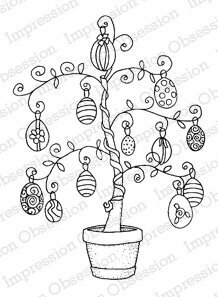 This clear stamp is great for Easter! 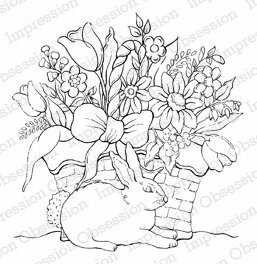 Images include: Bunny with tulip, bunny on a daisy, bunny holding an egg, bunny in flowers, small vines, small flower and sentiments "Some bunny loves you" and "Easter Blessings". Set of 9 clear stamps. Penny Black clear stamps featuring an Easter Parade. Easter themed Penny Black cling rubber stamp featuring a girl with baby chicks and a basket of Easter Eggs. A Mo Manning design. Easter themed Penny Black cling rubber stamp featuring a girl with her bunny rabbit and a basket of Easter Eggs. A Mo Manning design. 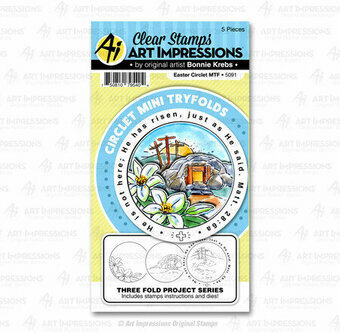 Easter themed Stamp from Art Impressions featuring a different kind of TryFold! 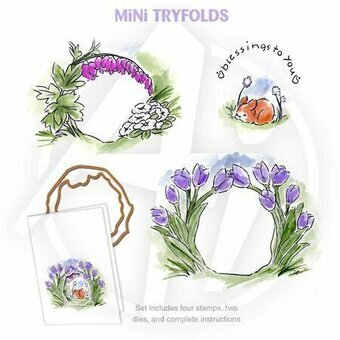 The Mini TryFold includes dies cut out openings to reveal the stamp behind. Tulips, bleeding hearts and pansies, a bunny and "Blessings to you". Set of 6. Clear stamp set featuring rabbit, chick, egg, and floral images for Easter. 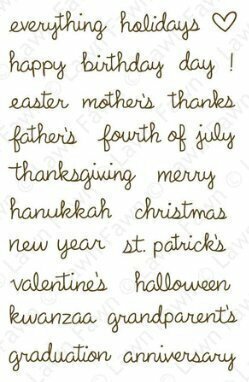 Sentiments include "Easter blessings!" "Some bunny loves you this Easter" "Happy Easter" "Here comes the Easter Bunny!" Like our other Mini TryFolds, create a three-paneled card revealing more images as you open the card! Includes clear stamps, dies to cut the openings, and instructions. This set features Easter lilies, the empty tomb, and crosses at Calvary. "He is not here; He has risen, just as he said. Matthew 28:6a"
Cling Stamp from Impression Obsession featuring the word "lamb".